Well, we only have 2 beers left before I take a break from this. It’ll be hard to leave 5 beer behind in the calendar undrunk. Alas, they will be all the sweeter when I return and can try them in quick succession and post my final days of beer! Luckily I’ll be trying some fantastic brews while away and will blog about those so you don’t feel like you're missing out! Today’s beer comes to us from Yorkshire, England. The Wold Top Brewery is located on 600 acres of farmland in Yorkshire. Owned by the family for generations, the traditional farm was not bringing in enough revenue. The decision was made to diversify - after 8 years of planning and discussing, in 2003 they brewed their first beer. Since then they have grown to include numerous traditional recipes and brew many beers that are distributed around the UK. Being on a farm, brewery owners Tom and Gill use ingredients that they grow right on site. Leaving space between their crops to allow for biodiversity, they make every attempt to brew using sustainable methods and local self-grown ingredients! The beer we will be trying from them today is a seasonal that is typically brewed as a cask ale (a beer brewed and served from an oak cask) that they have bottled for limited distribution. 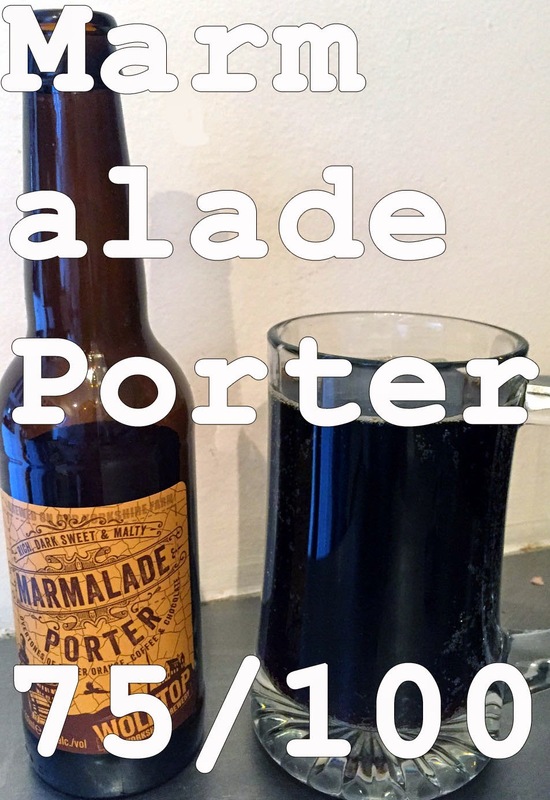 The beer is called the Marmalade Porter! Porters, like stouts, are dark and heavy beers that have been malted heavily. They are rich and often flavored with chocolate, coffee, or caramel malts to give them some balance to that richness. This one uses both barley and corn malts. It was rare to see corn malts in a beer until recently when the numbers of those with gluten intolerances soared. Now we find corn and even sorghum malts used in beers to make them “gluten free.” This one is not 100% gluten free - while it does meet the requirements for those who simply have an intolerance, it would not be good for those with celiac. On to the beer! Appearance: Rich dark brown with no apparent head. Smell: Chocolate, coffee, caramel and sweetness are apparent in the smell. Hints of orange at the end. Taste: Rich and heavy with a strong malt flavor and good sweetness. Has an odd metallic taste to it and a strange after taste that I attribute to the use of corn malts. Flavors are good and it is not overly sweet. Not a high quality porter but a unique one in the use of corn malts and the flavor profile. Mouth feel: Rich and full bodied with mild carbonation. Overall: A standard porter. Nothing spectacular about it but it also does not have anything really dragging it down other than the metallic taste and the odd aftertaste. The choice of malts was a good one, other than perhaps the use of corn malts in this case. The flavor profile is nice and provides for a good balance. Corn malts in a porter where malts are super important is a risky choice. I don’t think it worked here. Do I like it: I didn’t not like it, I’ll say. It is definitely not my favorite beer and one that I likely wouldn’t want to have again. It is a beer that I’d be fine drinking if there was nothing else but not one I would seek out to drink again. Overall it’s an average porter and an average beer.